SOMAPHONY is an audiovisual composition that can be played as an instrument and is embodied in a physical object representing the interface to the composition itself. The interface is built with our Instrumentarium for Audiovisual performance - SOMAPHONE - integrating generative music and visualization in one combined audio-visual instrument. 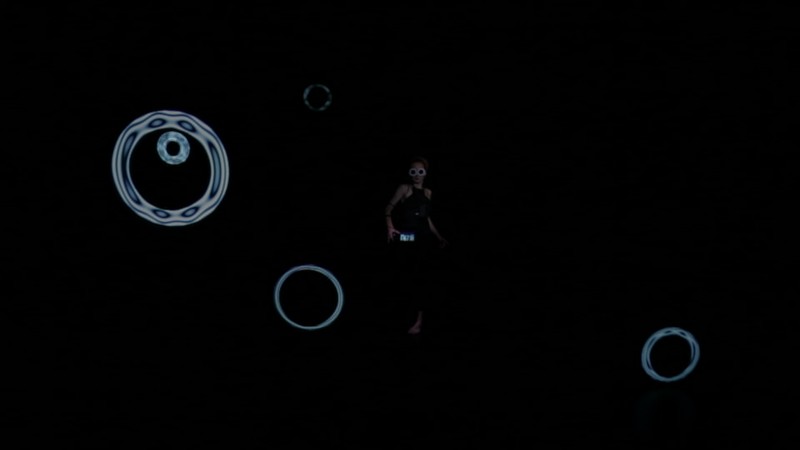 We use movement and gestures as a natural and expressive interaction with reactive musical and visual content. 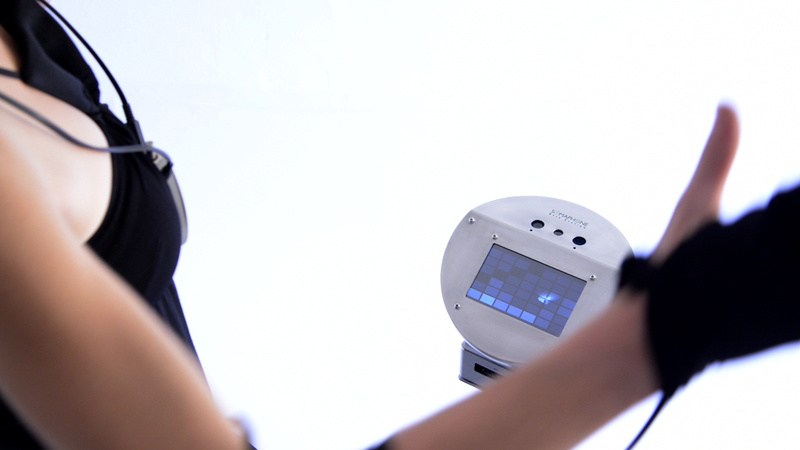 An important aspect of our work on SOMAPHONY is the embodiment of a non-linear composition into a hardware/software object in such a way that the performer can focus on articulation, intonation and remix, resulting in a musical and visual re-composition. 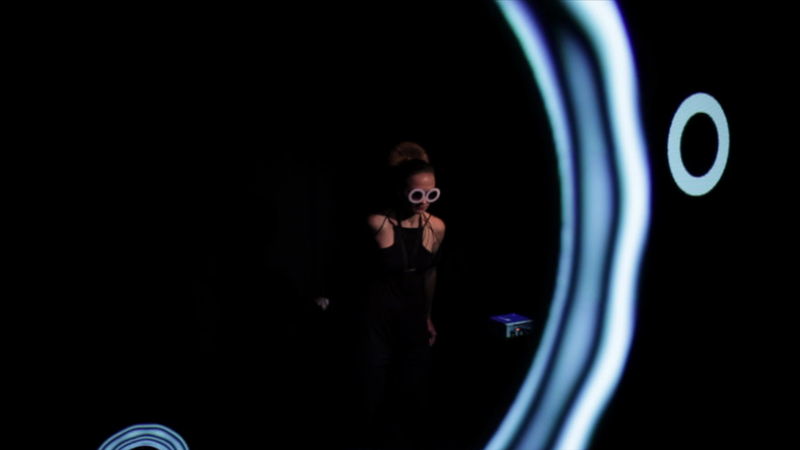 The project is focused on the interdependence between a digital instrument and a performer and how the performer can influence the behaviour of the instrument with his/her biofeedback signals e.g. instead of artificially applying pre-recorded groove - we use the slight changes in the heart-rate to influence the computer metronome or the fluctuations in the tension level of the body. Generally we want to avoid any algorithmic randomization and substitute it with the data acquired from the movement and the bio-signals. Such strategy results in more organic-like digital behaviours, which we explore within our project SOMAPHONY. With such an approach we want to explore the notion of an instrument that behaves differently from the linear, cause-and-effect response to action that we're used to expect from traditional instruments. 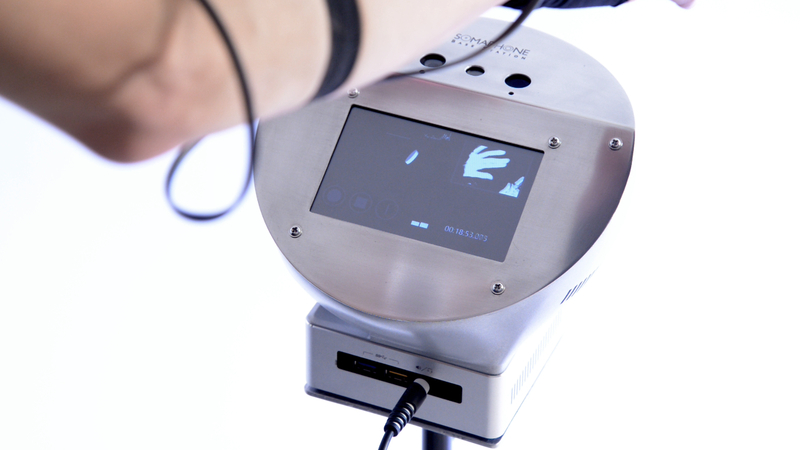 We see the contemporary audiovisual instrument as a creative partner. 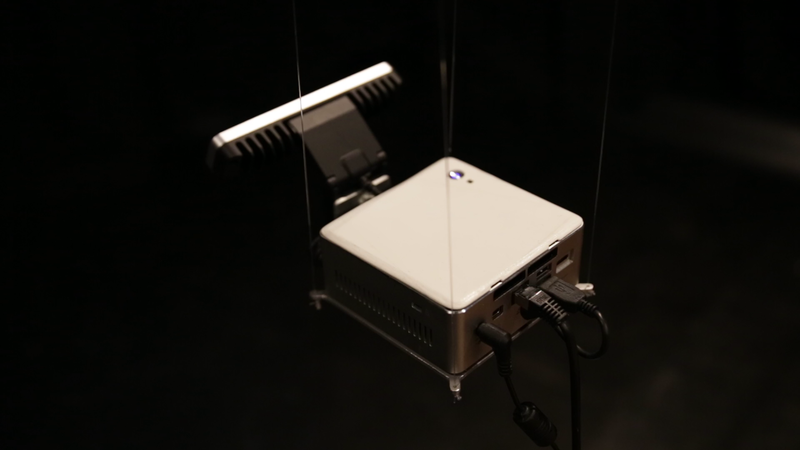 In this context, the interconnection between the instrument and its performer can be considered as a cybernetic relationship between an audiovisual artwork and its author. The emerging behaviour of the composition is a result of the feedback-loops between movement, sound, bio-signals and visual feedback. While developing SOMAPHONY we designed and prototyped a performative audio-visual toolkit - our Instrumentarium for audiovisual performance. 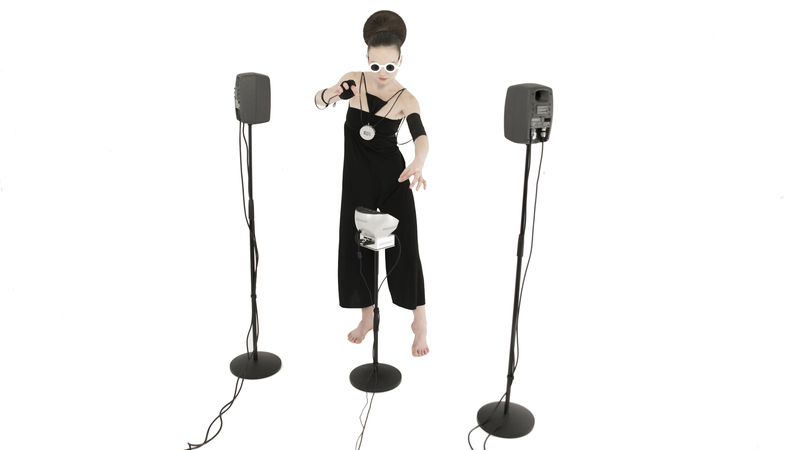 It includes hardware and software components that allow the control, articulation and intonation of a non-linear audiovisual composition in a natural and expressive way through movement, gestures and biofeedback. 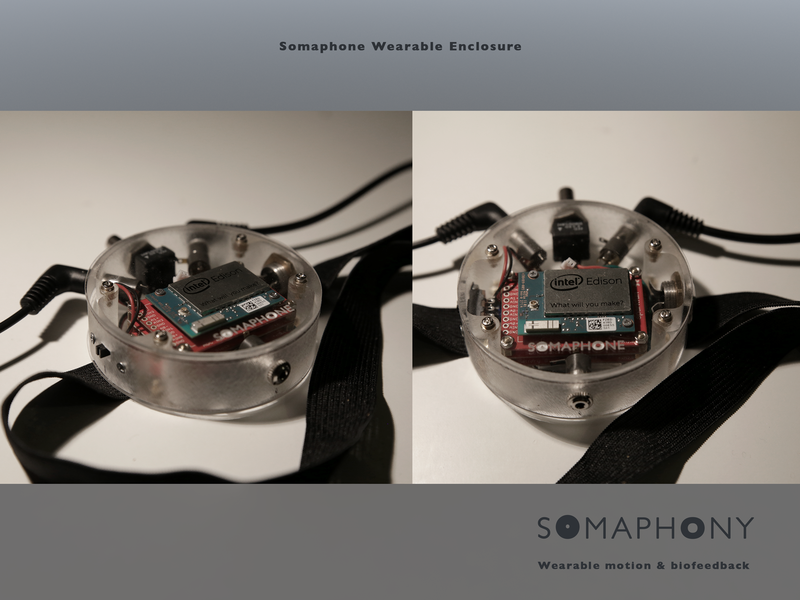 Our toolkit SOMAPHONE is currently consisting of a movement and biofeedback wearable wireless controller using INTEL® EDISON and a Base Station - a compact mini computer device based on INTEL® NUC Kit - responsible for the musical and visual synthesis. 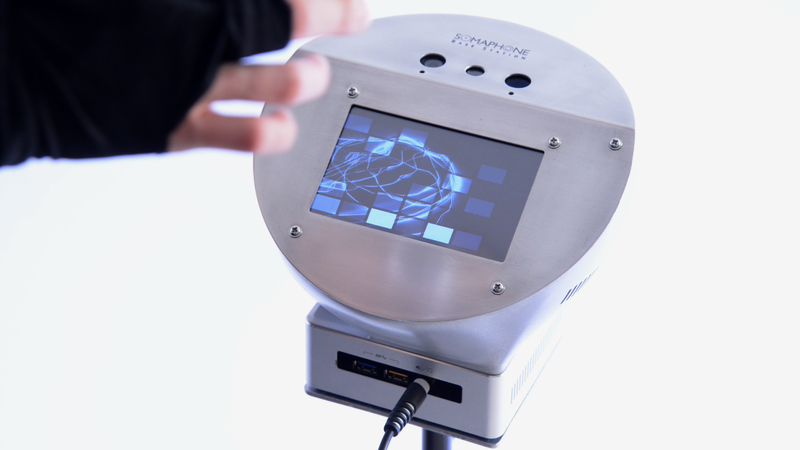 The SOMAPHONE Base Station is capable of tracking the performer's hands in 3D space and allows visual feedback and control of the A/V performance through its touch-screen. 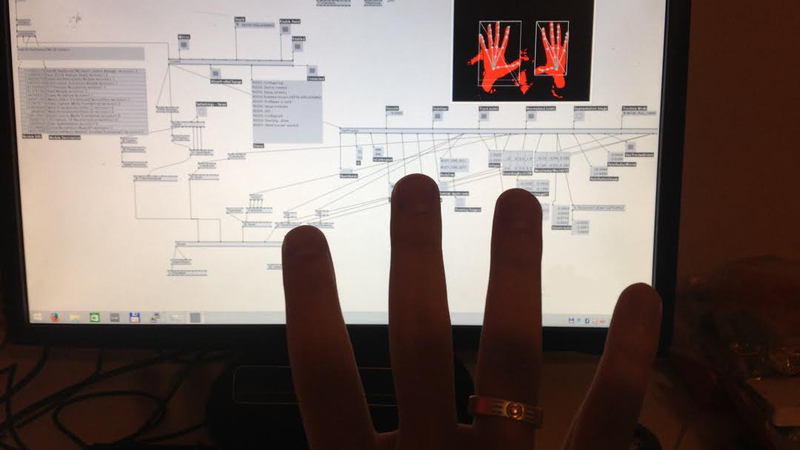 In favour of a more creative and effective exploration of different strategies in the audiovisual synthesis, we took the decision to separate the hardware and software components into modules that can be interconnected in a variety of ways, easily and in real-time. We choose to implement our software using mainly the graphical programming languages VVVV - employed to process the signal analysis, generative visualizations and MAX/MSP - within Ableton Live - as a good choice for sound manipulation in real-time. 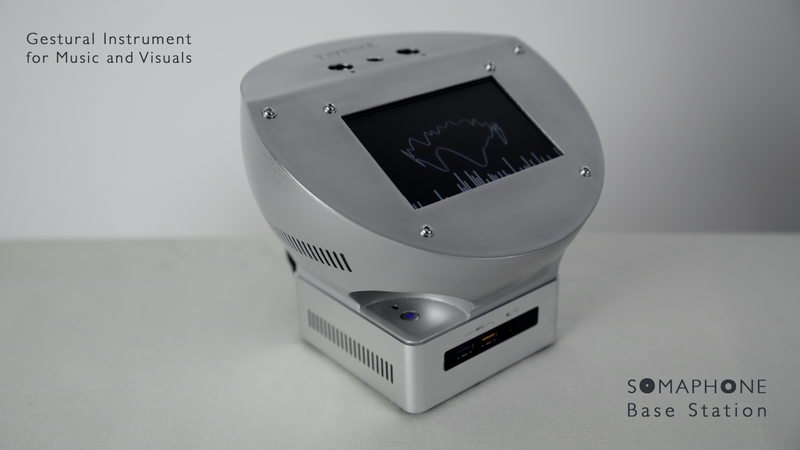 Nevertheless, we want to keep our instrumentarium open to other sound synthesis platforms capable of reading OpenSoundControl(OSC) messages, for example: NI Reaktor or PureData. 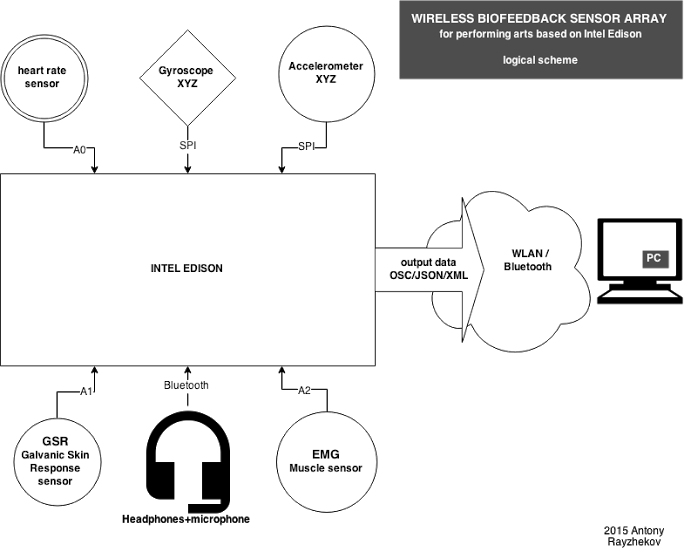 The term 'biofeedback' is referring to a continuous collecting of information about the state and/or course of change of a biological process occurring in the performer's body by using digital sensors. Such processes can include the heart-rate, blood pressure, muscle tension, galvanic skin response, as well as three dimensional information about the position and orientation of the body in space. A non-linear composition is divided in multiple fragments or phrases, organized in several scenes that can be interactively reordered and/or altered by the performer in a variety of ways, forming new sequences of fragments and phrases. This process of alteration and free reorganization is focused on the articulation, intonation and remix of each scene, resulting in a process of interactive re-composition. 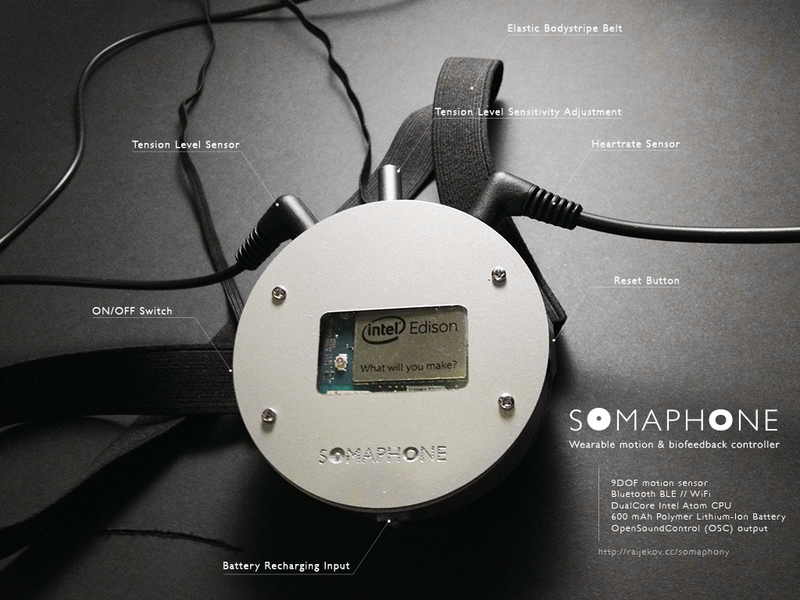 The Instrumentarium consists of two pieces: a portable wireless wearable device - SOMAPHONE and SOMPAHONE Base Station employed for the main audio-visual synthesis and control system. 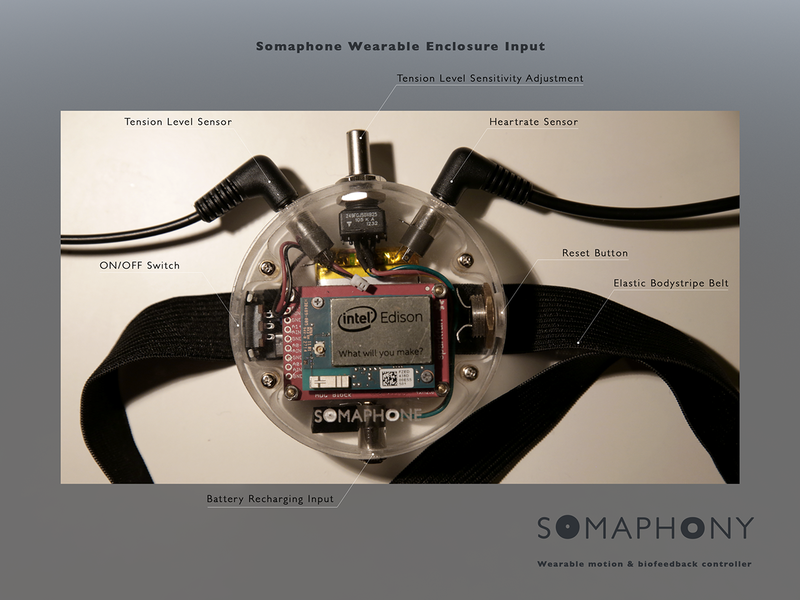 The wearable device SOMAPHONE can be attached to the body of the performer and is based on INTEL® EDISON equipped with sensors for capturing information about the changes of the biological processes occurring in the performer's body such as heart-rate and body tension - measured through the galvanic skin response, and also it is capable of sensing body orientation and movement in space. 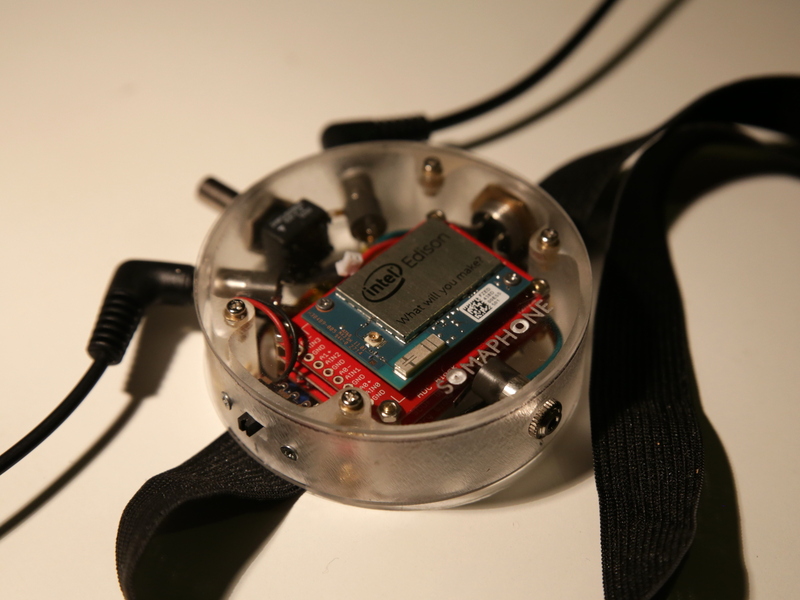 We used the Sparkfun INTEL® EDISON Blocks to quickly prototype our wearable device. 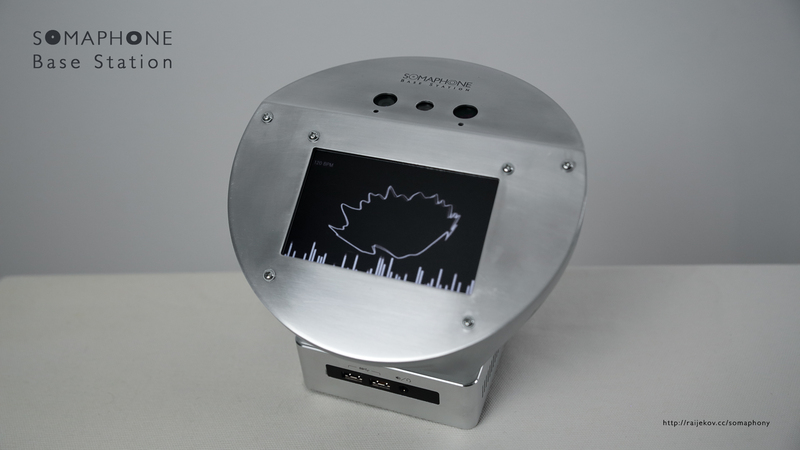 The captured information is streamed wireless to the main device - the SOMAPHONE Base Station via Bluetooth 4.0 LE for further analysis and is used in the sonifcation process and to control the generative music and visualizations in real-time. 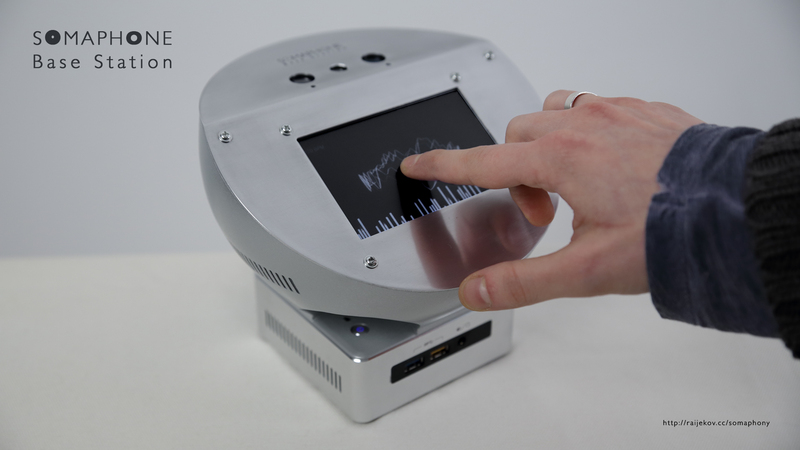 The second piece of the Instrumentarium - the SOMAPHONE Base Station includes an INTEL® RealSense™ 3D camera F200, tracking the motion of the hands in 3D space, a touch-screen to control the audio-visual performance and a powerful mini computer - INTEL® NUC 5i7RYH - performing the actual audiovisual synthesis. The 3D camera is used to extract information about the movement, such as phrasing and segmentation, recognition of postures and gestures. 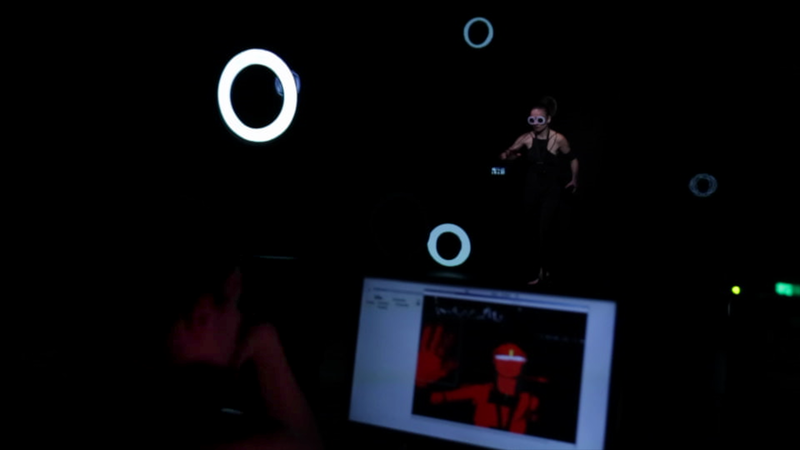 The motion tracking and the biofeedback signal analysis, as well as the visual and musical synthesis are tightly interconnected and allow a digital artist to form feedback loops between different media and the performer. NOTE: We are continuously working to release more resources, design files and code in Q2 2016. 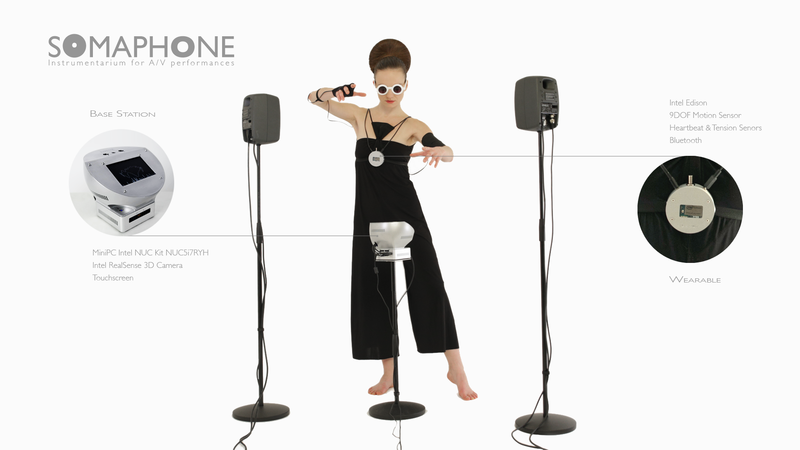 The project SOMAPHONY stems from a series of studies on musical biofeedback and movement, undertaken during the creation of the project 10VE - participatory musical biofeedback and movement composition for two actuators and an audience(2014/2015) by Antony Rayzhekov and Katharina Köller. As a part of the project development several experiments were conducted based on sensory input, detecting body tension, breath and heart-rate. 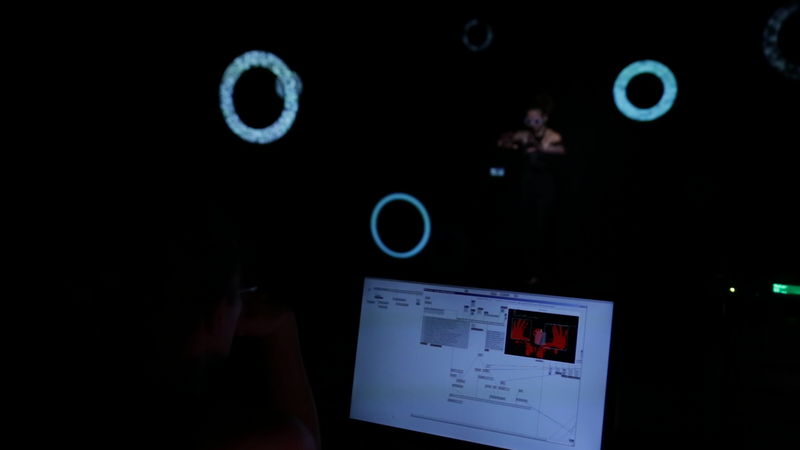 The result was a special piece of hardware and software, designed and created to enable the performers to control the generative process of music and visualizations through their biofeedback signals and movements in real time. 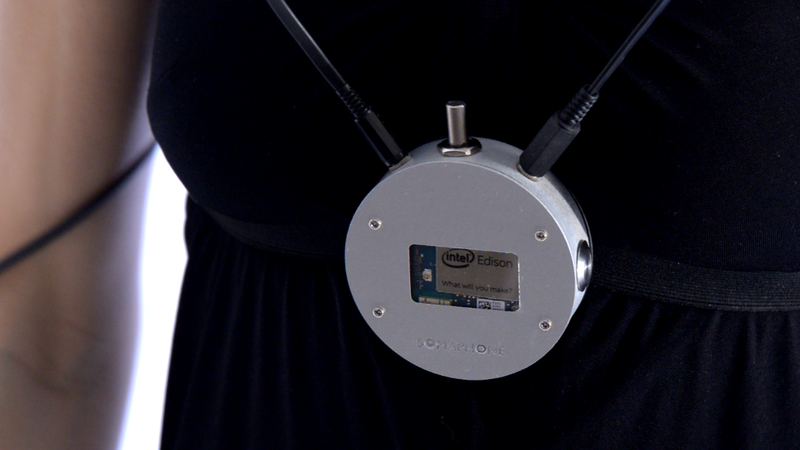 In the beginning of 2015 Intel contacted the artists Antoni Rayzhekov and Katharina Köller and commissioned an audiovisual performance using the micro computer INTEL® EDISON. 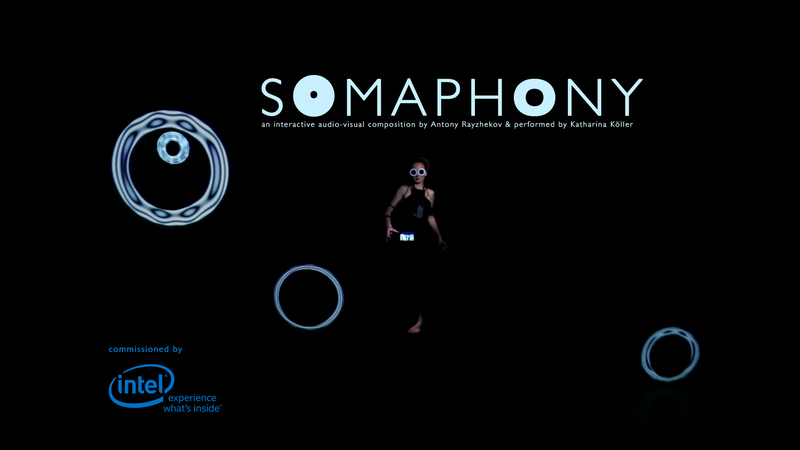 In mid 2015, the concept for the SOMAPHONY audiovisual composition was created. For the purpose of the project a state of the art hardware/software instrumentarium was created based on the experiences from the project 10VE. 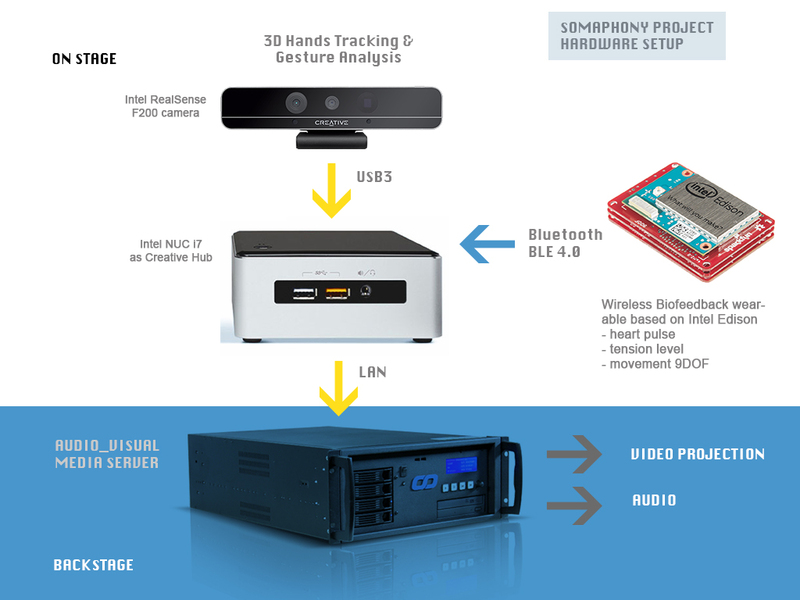 Within the project development several hardware components were additionally integrated into the interactive audio-visual system, such as the INTEL® RealSense™ 3D Camera and the compact INTEL® NUC computer kit. 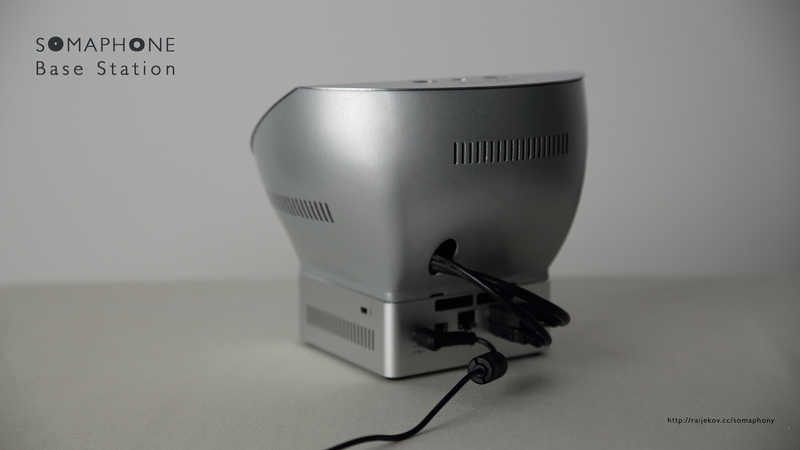 The SOMPAHONE Instrumentarium is developed in cooperation with INTEL® as a hardware provider and commissioner of the audiovisual performance SOMAPHONY. 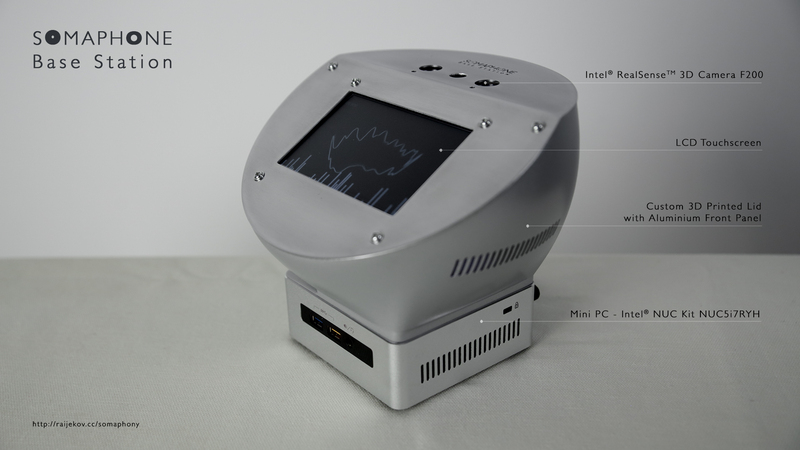 The project and its base components, such as the developed hardware, software and enclosures are published as open-source and aim to encourage, inspire and help other digital artists and peers to build upon and develop their own audiovisual interfaces based on movement and/or biofeedback. 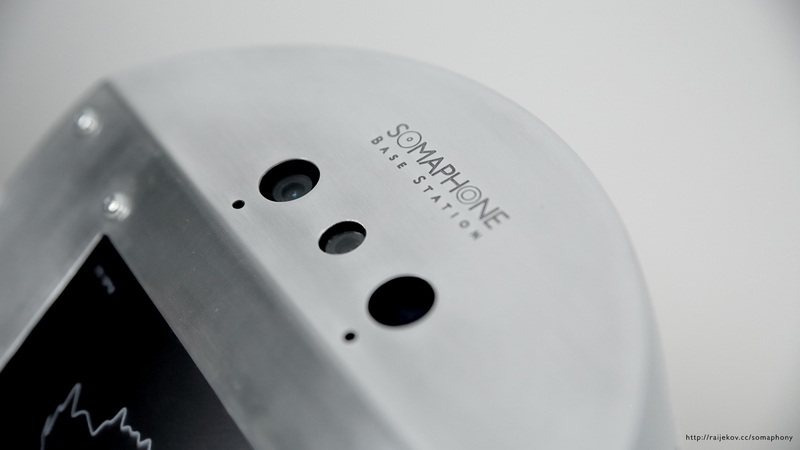 November 2015 | 3D Model of the second prototype of the SOMAPHONE Base Station. 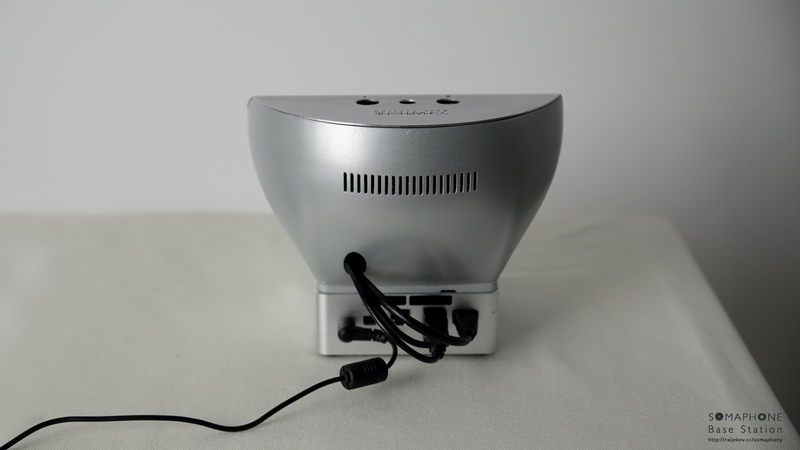 December 2015 - January 2016 | Second prototype of the SOMAPHONE Base Station. 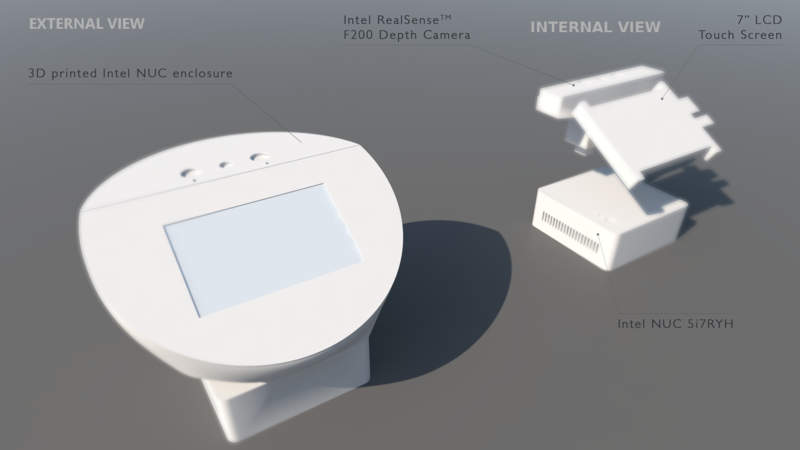 Standalone device with built-in INTEL® RealSense™ 3D Camera and a touch-screen.